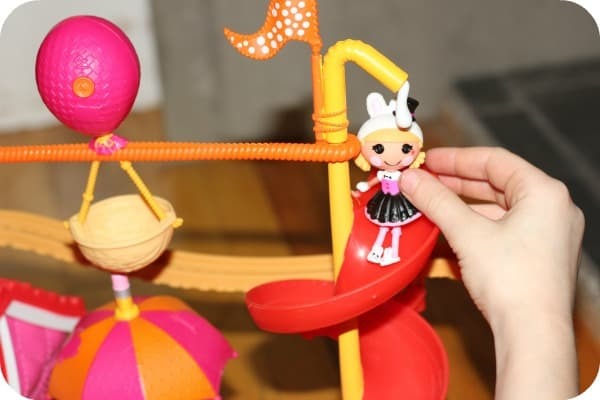 Bridget’s eyes lit up as soon as she saw her new Mini Lalaloopsy™ Silly Fun House Playset! She has a Lalaloopsy doll and actually has the Mini Lalaloopsy toys on her Christmas wish list. 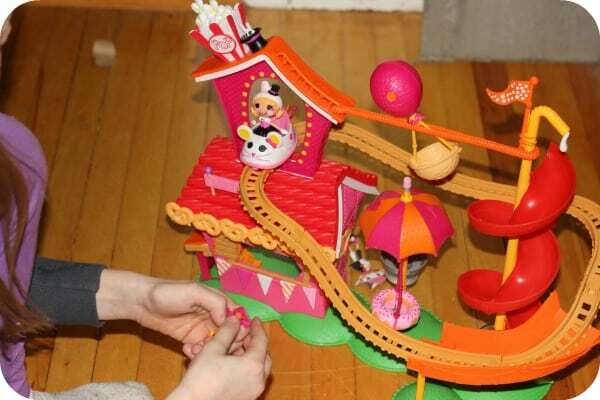 Bridget had hours of fun playing with her Mini Lalaloopsy™ Silly Fun House Playset. It’s like an amusement park for toys! It has five different rides including a rollercoaster, zipline, teacup swing, twisty slide and a snack shack. It also comes with an exclusive Misty Mysterious doll and her pet bunny. Plus there’s extra accessories included like pretzels, balloon, and even a cash register for the snack shack. Bridget’s said her favourite part of the set was the rollercoaster. She straps Misty in (yes, there’s even a little elastic seatbelt to hold her in) and away she goes in the little car. Misty has moveable limbs so its easy to put her into the various contraptions in the set. As for setting it up, it was fairly straightforward. There’s instructions and a diagram and it took me about 10 minutes to do. The longest part was removing all the packaging. 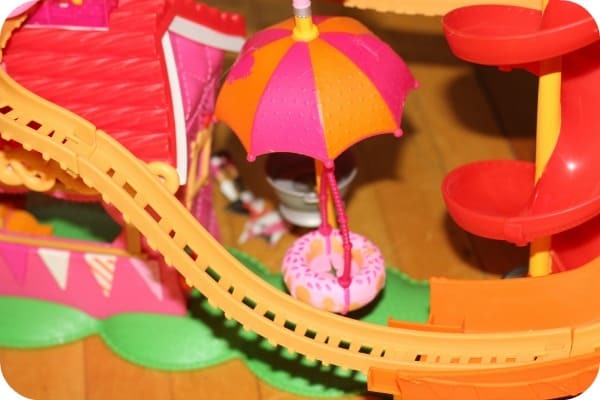 I was worried the track would be too wobbly but it seemed secure once every part was in its proper place. 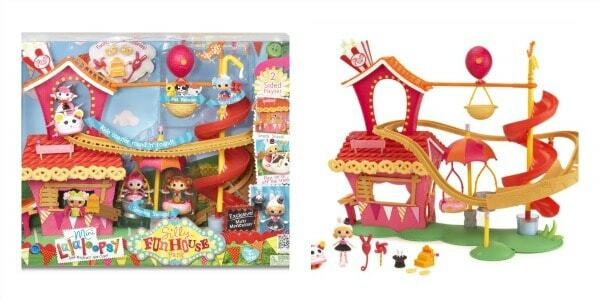 The Mini Lalaloopsy™ Silly Fun House Playset is recommended for children ages 4 and up and retails for $44.99. I checked online and saw that it was available at many popular retailers like Walmart, Toys R Us and Amazon.com. This is so cute! Thanks for sharing, I’m getting lots of great Christmas ideas! This looks like a fun toy. And easy to put together. Thanks for the great idea! My 5 year old would love playing with this!!! Most definitely would keep her busy for a while. This is absolutely adorable! I wish I were a child just to play with it without looking silly lol. This looks so fun! We love the Lalaloopsy line, though we only have a full-size doll. I suspect we may need to add some mini dolls and a playset to the wishlist. Thanks for the great photos! 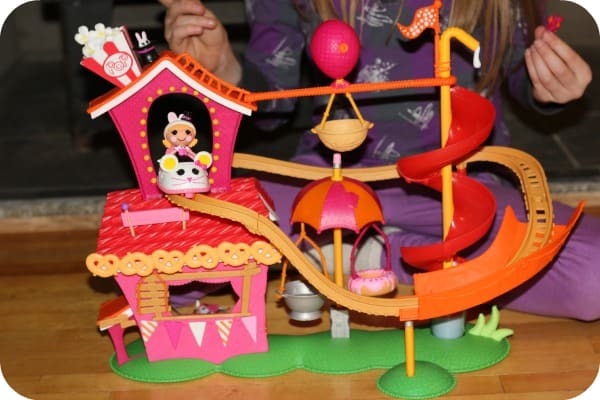 This playset looks like it is really cool and would make a great gift! This looks so fun! I love that they are including extra accessories. That makes it so fun when there are all those little extra fun things. This will make such a great gift! looks like a lot more fun than the traditional dollhouses I grew up with! I always wonder what age this is for. Is an 8 year old too old for this? Nope. My daughter is 8 years old and she loves playing with it. My niece would love this toy. It’s so colorful and bright! She likes toys that have small pieces and lots of things to do. 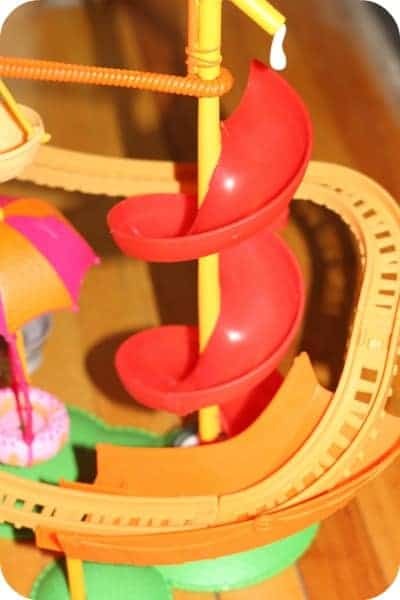 I’ve been reading reviews on this playsetmr and a lot of people said the pencil that holds the track up isn’t very stable and always pops off. Did you find the pencil to be a problem? My daughter is dying to get this for Xmas or Bday and I just don’t want to spend that much if its going to keep falling apart. Thanks.